This Irish snowman ornament is ready to hang on your tree with the included gold cord. 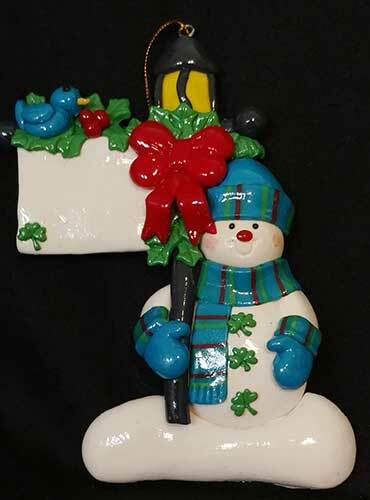 This Irish Christmas ornament features a snowman holding a lamppost and it is accented with green shamrocks along with holly and berries and even a bird. The Irish snowman ornament is wearing a hat along with a scarf and mittens. The snowman Christmas ornament is a colorful hand-painted and dimensional design that is made of polymer clay; he measures 3" wide x 4 1/4" tall.